With pro v1.5.7 I focused once more on improving existing features and overall backend usability. The authentication method for the Maps Marker API has also changed completely and the old authentication method with public key only is not supported anymore! So if you´re using the API to manage your maps, please upgrade your application before updating the plugin to the latest version! Please see below for more details. The updated setting will get saved once finish by publishing or updating a marker or layer map. Until v1.5.6 you only had to use a public key to execute API actions. Although there are several additional security layers available (like accepting requests from specific IPs only or specifying a referrer needed), this authentication method had its shortcomings: anyone who got to knew this public key (by tapping network traffic or having access to request log files for example) could perform any API action (especially if there were no additional security layers active). Since v1.5.7 all API requests must now be authenticated using an expiring signature which requires a public and private key as well as an expire value. This is similar to the approach used by Amazon to secure access to their S3 Storage API. Once authenticated, all activated API actions can be executed. Anyway this is not really recommended, as the safer approach is to programmatically create a signature which for example expires automatically in 1 minute! Please note, that the old authentication method with public key only is not supported anymore! Please upgrade your application before updating to v1.5.7! In addition to the security measures enforced by the API, it’s strongly advisable to implement SSL for the WordPress site (beyond the scope of this API). For more details please see the updated MapsMarker API docs – if you have created a cool application using the Maps Marker API, please let me know and I will add it to the showcases! With v1.5.7 I also added the new API action “search”. With that action, you can perform searches for any attributes of marker or layer maps. See the parameter tables in the MapsMarker API docs for an overview. The search action also allows to perform bounding box searches (“show me all markers within an area”) and date-range-searches (“show me all markers created before 2013-01-01”). For more details please see the updated MapsMarker API docs. 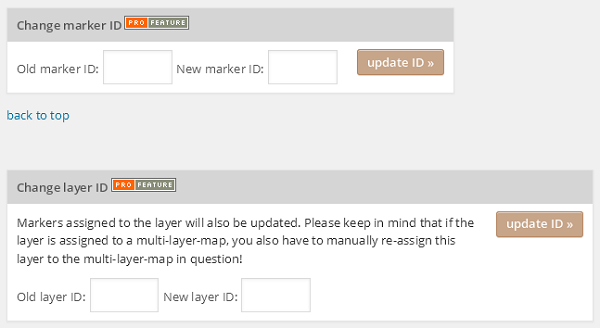 Please keep in mind that there is one limitation when changing the ID of a layer: if the layer is part of a multi-layer-map, you manually have to re-assign the layer with the new ID to the multi-layer-map, as this does not get updated automatically! Until v1.5.6 the bulk update feature for marker maps on the tools page had one shortcoming: you could only change all existing marker maps and make no selection. Until v1.5.6, the character ‘ was escaped as \’ when it was used in marker or layer names. This is now fixed (thx Eric for the report!). Please keep in mind, that this fix does not affect already created map with ‘ in the name – so after the update to v1.5.7, please open the affected maps, correct the name and save them again. If you want to contribute to translations (new Hindi translators would be appreciated! ), please visit https://translate.mapsmarker.com/projects/lmm for more information. Please note that translators are also compensated for their contribution – for example if a translation is finished less than 50%, the translator gets a free 25 licenses pack worth €199 as a compensation for completing the translation to 100%.